The objective of this evaluation is to analyse the long term contribution of selected major investment projects to economic development as well as to the quality of life and well-being of citizens, including their effects on the environment. The evaluation addressed five criteria (relevance, coherence, effectiveness, efficiency and EU added value) through a consistent use of retrospective CBA and qualitative analysis. Findings show that major transport projects can positively contribute to increasing the transport efficiency within EU regions, supporting the shift to cleaner urban mobility and facilitating cross-border transport connections. There are two main critical success factors: a sound forecasting capacity driving the project design and selection process and excellent managerial capacity to keep the project on track. The EC has an important role to play. 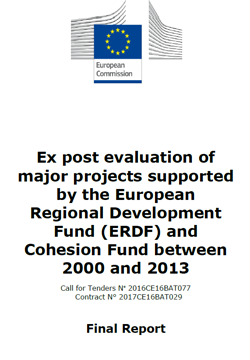 There is evidence that, more than merely providing funds, the EC can strategically guide the prioritisation and selection process towards projects that maximise EU objectives or are implemented according to well defined quality standards (e.g. environmental measures). In addition, EC services can provide technical assistance to improve the quality at entry of funded projects. While a lot has already been achieved, there is room to expand EU added value in the implementation of major projects.